Intuit has released an iPad app for its QuickBooks Online service in a move that will help small businesses be more productive when they’re on the go, no matter where they are. With the addition, users now have one more way to use the cloud-based accounting solution — it already is available on the Web, iPhone, and Android devices. With QuickBooks Online, businesses receive automated invoicing, billing, and reporting along with the ability to manage their bookkeeping and accounting right in the cloud across multiple devices. The company says that it has 400,000 small business customers, ranging from sole proprietors to those with multiple employees across a wide range of industries. In total, 1.3 million people worldwide are using the service. Available in the App store, Intuit says that its QuickBooks iPad app packages useful on-the-go business tasks in an “easy-to-use, friendly” app with a native iPad experience. It also includes integration with the device’s camera, contacts, push notifications, and location services. It’s well-documented that iPads are popular among small and medium sized businesses and Intuit has picked up on this fact — the company tells us that more than 20 percent of its iPhone customers use the app on the iPad, even though it’s not optimized for that screen size. When the app is first used, it offers pretty much the experience that you think it should. The company set out to help make it “approachable”, friendly, and make users feel comfortable with what they’re doing. After it has been installed on the iPad, users will find an on-boarding process that will guide them through creating their first invoice and inputting their information — all of this before an account is created (seemed a bit backwards to us). 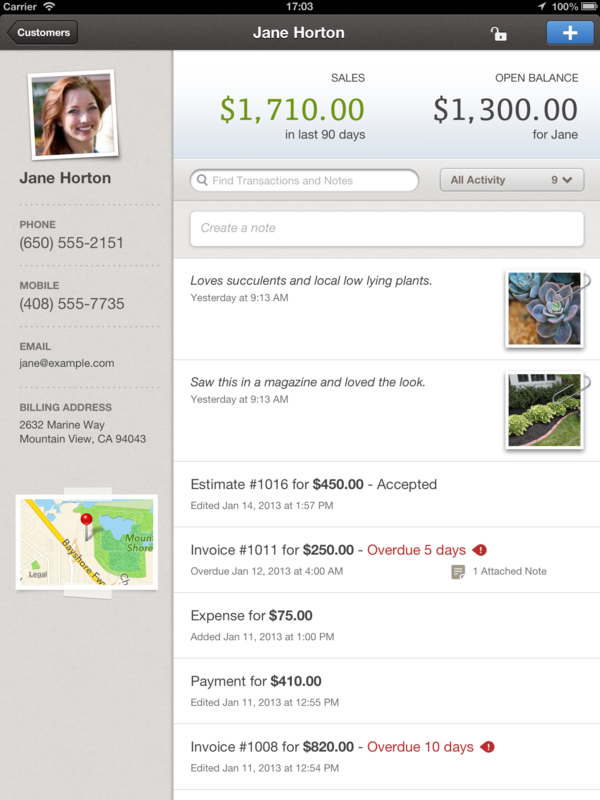 This sign-up flow isn’t in QuickBooks Online’s iPhone app — special to the iPad. During the part of the process where the user enters their company information, one of the new and unique features of the iPad app appears. QuickBooks has added an integration with business data provider Dun & Bradstreet — something Intuit says doesn’t exist on any other apps. Based on user feedback, this feature may be rolled out for its other applications. After signing into the app, the service will sync all of the company’s data shared across all devices. That way, if you make some changes to an account on an iPhone, it will be saved and displayed on the iPad and also the Web — the power of the cloud. It also pulls in relevant information from Gmail, Yahoo, and LinkedIn to help make sure customer contact information is as up-to-date as possible. Facebook’s service is also tapped to bring in avatar photos for customers. With the customer feed screen, businesses can jot down notes while they are there on the scene without having to recite it from memory or transcribe it later on. Using the iPad, users can take photos of things that need repair, specific items that need to be worked on, or anything else. Notes can be included too. The result is that the complete customer interaction can be cataloged so that not only is the project specifications correct, but it can be used for multiple employees to collaborate on. While it does own Mint, Intuit has not integrated the personal finance service into its QuickBooks Online offering. 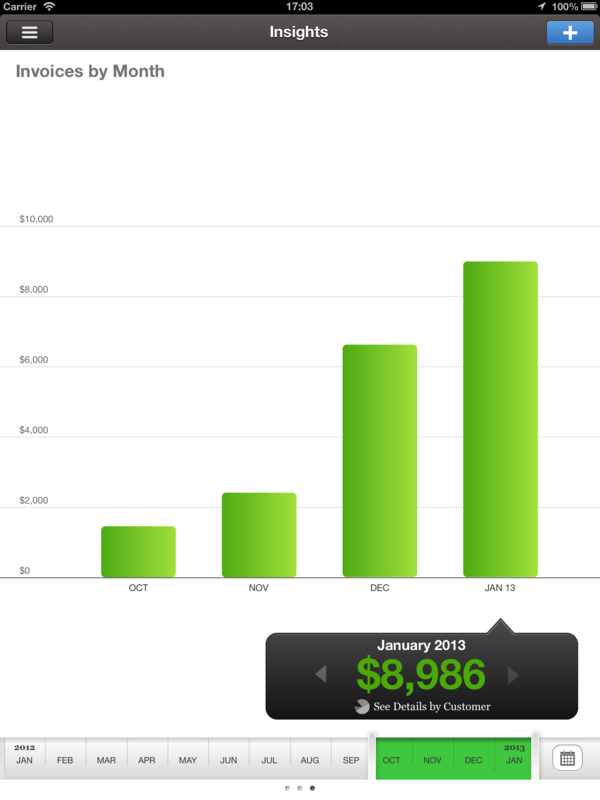 However, it has drawn inspiration from Mint’s graphs and it’s apparent when you view the reporting features on the iPad. Third-party integrations with services like Bill.com, Salesforce, and others are also supported with the app. Existing QuickBooks Online subscribers in the United States can start using the app with their account information immediately with no additional cost. New users will need to sign up either for a monthly or annual subscription through the in-app purchase functionality. QuickBooks offers a 30-day free trial, but afterwards, has plans starting at $12.99 per month or $124.99 per year. 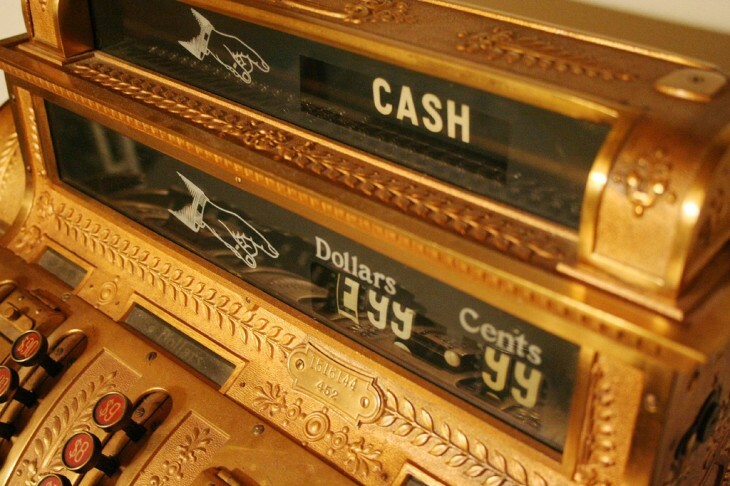 Intuit says that Android or Windows 8 tablet applications could be forthcoming. First, however, it is monitoring how the iPad app and its other services perform.